What a name for a calf huh? Well, that’s his name and how do you tell an 11 year old that you bought him from that you are going to change his name??? You can’t. So, I call him Tommy. 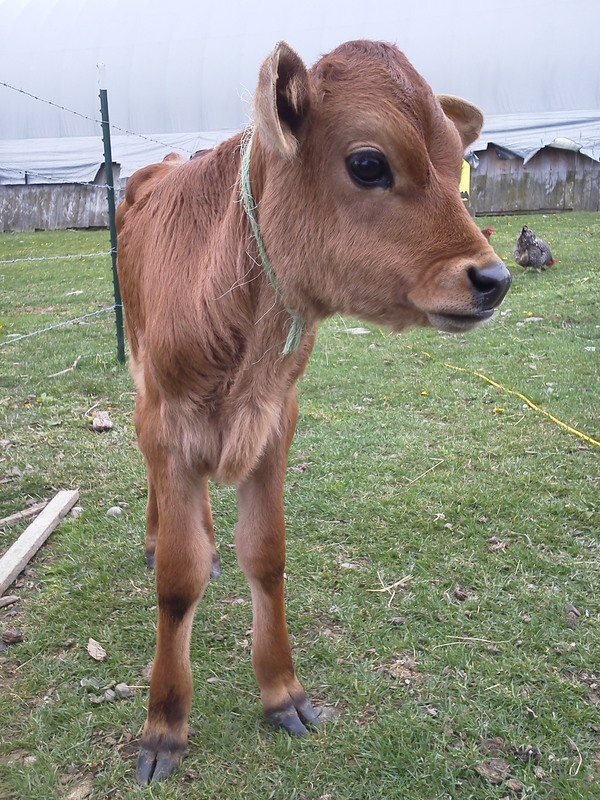 Tommy is a one month old Jersey bull calf that we purchased from the grandson of a nearby Jersey dairyman. I wish I had taken photos while I was over to their barn….but, I was kind of like a kid in a candy store with the 70+ jerseys cows in that barn. I even asked Merle, the original owner, if I could rent a room. For a jersey lover…it was paradise. For a dairyman…it’s a beautiful barn with perfectly clean stalls. Lawton’s dairy is one of the nicest barns I have ever walked into. It’s bright and well light. The girls are all so clean. There is no poop built up behind them when they stand in their tie stalls to be milked. If there is even a spot of poop on the cow, she gets cleaned. It’s a beautiful thing! I know all this may sound strange to someone who isn’t involved in dairy operations so let’s compare it. It’s like going into a beautifully designed home with all of the newest and prettiest features compared to a rundown single wide mobile home owned by slobs. HUGE DIFFERENCE. My barn seems dark and dingy in comparison…but ours isn’t finished off on the inside or painted yet either. Lawton’s barn is what I envision for our farm. Back to the animals…while we were there, I got to take an inside peak at the cows they were sending over to the Spring Jersey Sale too. They are all such beautiful cows but one…I would have taken her (and I just might if I can get the winning bid)! It was amazing to see how gentle they were with them and how similar their cows are to the ones we have here. No fussing, no fighting…just a gentle walk up onto the hauler. Another thing that was going on while we were there is the one grandson, Nathan, was doing his chores. Nathan is 11 years old and on his own decided to start raising steers from the bull calves born on the farm. HE does all the care for them expect the morning milk feeding of the young stock on school mornings, then grandma does help him out but when he isn’t in school, he is doing all of the work. He is currently up to 18 steers that will be ready at various times after the summer months. He does a great job! He works on all of his own equipment, including the tractor. He is exceptionally intelligent and I am so impressed with him! Thinking back now to the Department of Labor proposal to the Farm Kid Labor Laws, it really hits me when I watch this young man who is so dedicated to building himself up with minimal assistance from his family just how a law like that would change the scope of farm families. Nathan is a kid with a bunch of energy but he has the ambition to do something. Could you imagine the type of trouble he could get into without the daily routine of caring for his steers? I know, I have seen it personally. So…to all of my readers and followers, let me know if you are in the market for some excellent quality, tender Jersey beef. I know a kid who will be selling some this year!